Hogwarts reminds me of Michigan School for the Deaf. Students living at the school and sleeping in the dormitory is one thing. But that’s not all of it. At MSD, there were students from all-deaf families. Their parents were deaf, their siblings were deaf, their grandparents, aunts, uncles and cousins were deaf. Several students who were my age had older or younger brothers and sisters at the school. And some of their parents worked at the school. So, yeah, I saw some pure deaf families. And there were students who came from hearing families. I haven’t personally experienced this, but I heard that some of the students from the all-deaf families didn’t like it that deaf students from hearing families attended the school. 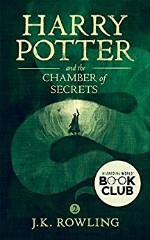 We see that attitude in Harry Potter and the Chamber of Secrets, the second book of J.K. Rowling‘s Harry Potter series. Harry returns to Hogwarts for his second year of witchcraft and wizardry studies. This year, he learns an ugly term, mudblood, which is a reference to wizards and witches who come from Muggle families. The term is usually voiced by those from pureblood wizarding families, who are bigots toward the Muggle-born. Well, the Chamber of Secrets was another fun book. It was quite funny in places, too. I laughed a lot while reading this one.